A currency is the legal exchange for goods and services in a country. It also reflects the current situation and strength of the economy of that country in comparison with other countries in the world. The value of a currency in respect to anther greatly determines the level of satisfaction a person derives from it. All African countries have a specific currency specific to it, that it use as a legal tender to transact business and for foreign exchange. 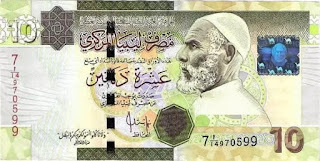 The dinar (Arabic: دينار ) is the currency of Libya. Perhaps it’s oil which is keeping things afloat but one Libyan Dinar will set you back around R8.53 currently, making it the strongest currency in Africa. Another surprising example of a strong African currency, is Ghana’s Cedi. Ghana is well known for its extensive natural resources, namely Gold from it’s Ashanti region. The Cedi is actually in it's 3rd rendition under the same name as the currency has been revalued a couple of times. The most recent revaluation was 2007 and it’s lost almost 50% of it’s value against the Rand since then, so the current rate of R3.79 for 1 Cedi shouldn’t last long. The Rand has had a lot of flack for its devaluation over the past couple of years. Tunisia’s Dinar gained almost 20% against the Rand this year. One Tunisian Dinar will now cost you around R6.65. The nakfa is the currency of Eritrea. The country split from Ethiopia in the early 90’s but has a currency, roughly on the same value as ours. This is only a recent development though since the beginning of 2014 and is as a result of the currency being pegged to the US Dollar. 1 Nakfa will cost you R1.01. Revalued successively during its post-colonial period, the most recent revaluation came in 2011 following the independence of the oil rich Southern half of the country which became South Sudan. The Sudanese Pound is now worth R1.85. The Pula has been stronger than the Rand for some years now and the country’s economy and political structure is often lauded as a shining example of how an African democracy can work. 1 Pula will cost you around R1.20. Morocco’s currency wasn’t always as strong against the Rand, in fact it was as recently at October 2012 when the Rand was more valuable. 1 Moroccan Dirham will cost you R1.29 currently. The country formally known as the colony of Northern Rhodesia has sadly never been known as an economic success story and at a stage had an exchange rate of 1 US Dollar = 5120 Kwacha. The currency was revalued in January 2013 and until recently 1 Kwacha cost over R2, today 1 Kwacha buys you only R1.73. Egypt, despite all its political turmoil has been able to retain a lot of its country’s currency value.